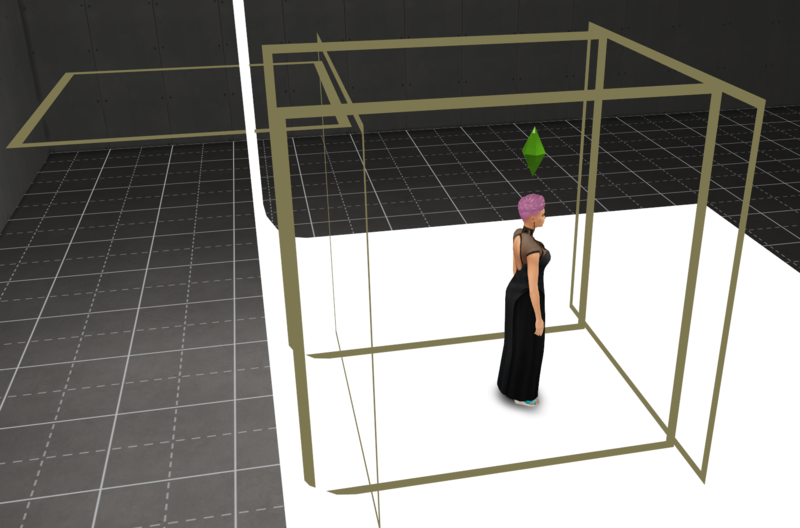 Hello and welcome to the official Sims Editing Workshop thread! As I’m sure most of you know already, we are a Discord server created to help people with their editing, whether it be for personal use or competitions. Now we are launching a thread as well! While I still recommend the server for the best experience and other resources, this thread will be hosting the same challenges as the server so forum members can learn too! This is not a competition but instead an activity, meaning all rounds are optional. You are also allowed to complete the challenges at a later date if you missed a round and would like feedback. When a new challenge starts, I will post the challenge in a new post and also on the front page. It will provide information (tutorials, links, examples, etc.) for you to learn from and at the end of the info will be your assignment instructions as well as the due date. This assignment will be based on what you just learned and will be what you receive feedback on. No scores though! While we may pick an image that reflects the topic the best, you will not receive scores, just plenty of feedback. We also have different workshops for different levels, but everyone is welcome to participate in any of them! Advanced members can join Beginner challenges, Beginners can join Advanced challenges, and so on. Just keep in mind that the wording and expected knowledge is different for each level. There may also be mini workshops (labeled as .5) that cover misc. information, are small, or are assignments to check on your progress. Hopefully that explained everything! I had to edit these a little since this is the forum, not Discord. Respect, respect, respect. Please leave all drama to your llamas! ZERO Face plastering/use of human body parts allowed. That goes for hair as well. We are wanting to encourage enhancing your sim to artistic levels, not "make them real". Be kind when giving critiques and make sure it is wanted. This is a place to uplift the editing community. Any harsh or rude comments will be looked at as a form of bullying. NO Spamming, Politics, or Religion! When a Challenge is going on treat it like a competition. Veterans are going out of their way to put these together. Check in often and try to be timely. NO Cheating or Stealing others work! Veterans put in the time to teach you skill sets, and so should you to learn them. And MOST IMPORTANTLY remember to have FUN & be ENCOURAGING. This server/thread is meant to help everyone advance and hone their editing skills & styles. Please try not to get discouraged, we all started at the bottom and still don't know what we are doing half the time. The first challenge is here! We’re going to keep this nice and simple to move things along quickly. This first challenge is based off of my Game Setup (S4 Edition) tutorial because game setup is extremely important. If you want more info on other mods, etc. then I recommend reading the tutorial during your free time. 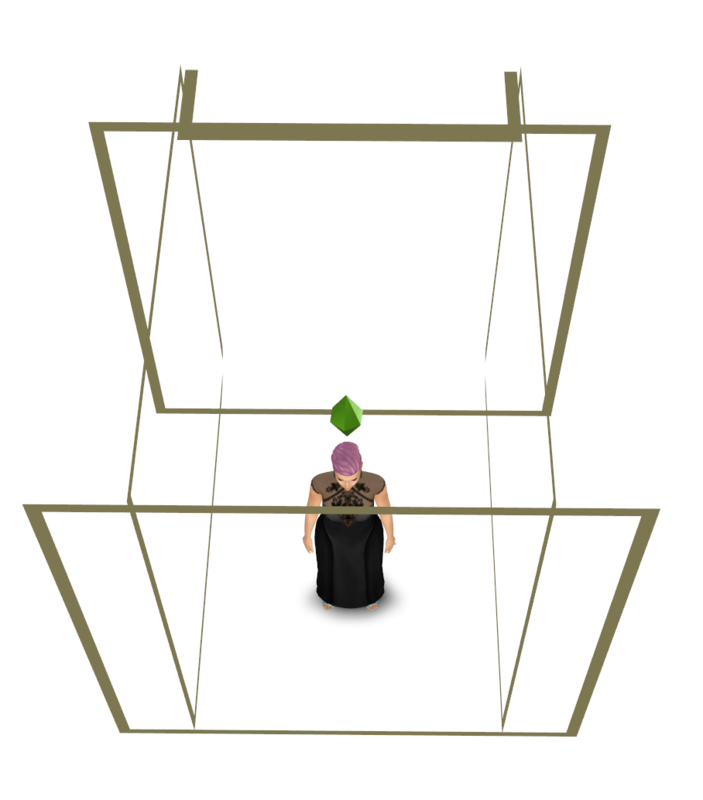 Also, if you use Sims 3 let me know and I’ll grab the related items for you. For this challenge we have a total of 5 small parts for you to look at, with 4 being about the game and 1 is about cropping. I will explain your assignment (what you turn in) at the end. Mods are very important for editors. They make things easier and improve the game so we do less editing, like the CAS Lighting Overhaul by LumiaLoverSims. That mod removes that awful blue and green highlight from CAS so your CAS shots can look good and you don’t get marked down for lighting. The mods I list below are what I recommend for improved pictures and workflow. There are others I would recommend too, but they either are broken or have been removed. For more options and other useful mods and tools, check out the tutorial. The names should speak for themselves about what the mod does but click on the links for more info if you are confused. Your settings should be as high as your computer can allow it, especially for photoshoots. However, if you never do in-game shots you can adjust certain settings so your sim is great quality while ignoring everything else! Here is what your settings should look like if your computer allows it and you do in-game shots along with regular photoshoots. If your computer can’t handle the high settings, medium is your next best option, but make sure your Sim settings always take priority. Or you can turn your settings on high for photoshoots, turn them low when playing. 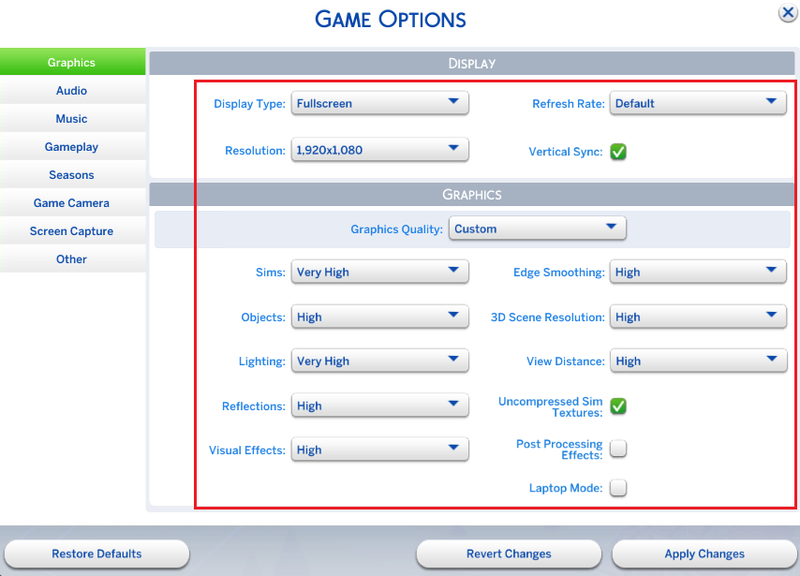 Fullscreen Mode – make sure your max screen resolution is selected. Do NOT take pictures in windowed mode. It will squish your images down and lower the quality. I am unsure of the “Windowed fullscreen” though, so use that option at your own risk. But if you don’t do in-game shots for whatever reason and only do CAS and photoshoots, here are the settings you need to focus on. They will make your sim look good and solve most quality issues. Everything else can be set low, but you still need full screen and max resolution. See, almost done! Told you this was quick. Next is your photoshoot building. Normally I would recommend a modeling save too, but that is best if your game takes a while to load, you need room for set building, or if you also occasionally do in-game shots. A modeling save is clear of buildings and in a versatile environment, with only your model(s) and your photoshoot building present in the beginning. You can also be free of a photoshoot building and take pictures outside. I only recommend that if you know what you’re doing when editing to correct the lighting and properly remove them from the background, so for beginners stick with the photoshoot building. Your building is not done yet as it still needs lighting! This is the main focus of the challenge, besides cropping, because good lighting is important to minimize editing. A lot of people don’t realize that when starting out and we see all kinds of weird lighting going on. 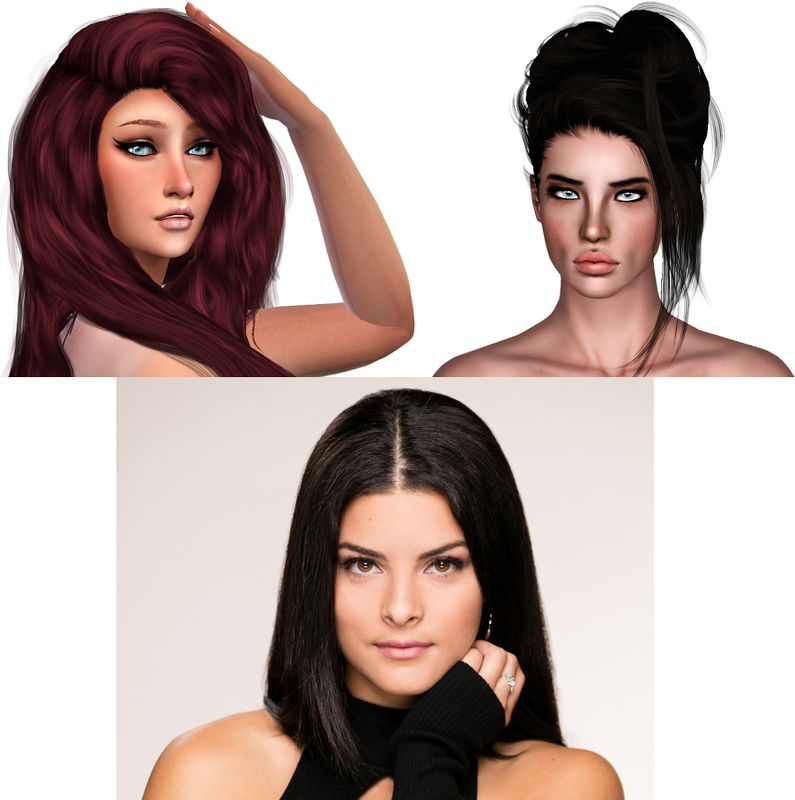 First, keep in mind that there are different types of lighting for different situations and that lighting affects skin tones, poses, and CC differently, so you may need to adjust the lighting based on the sim. 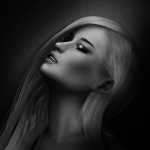 One type of lighting is neutral lighting for those who want to do their own lighting/shadows. You generally won’t need this type of lighting until you are Intermediate, or you feel like practicing before then. Then there is, what I would call at least, basic lighting that gives you enough brightness and shadows to work with majority of backgrounds. There are others, but for now we’re just going to cover these two. The first lighting we’re going to cover is neutral. I don’t recommend using regular lights (lamps, wall lamps, etc.) in your photo studio because they cause problems in numerous ways. One is that they frequently get in the way, two is that they don’t have a large radius, etc. So, we’re going to be using debug lights for this tutorial, and later at least one ceiling lamp (I’ll explain why). I recommend getting familiar with debug lights because if you ever do in-game shots they are a life saver. Of course, you’ll need the cheat first to get to the lights. 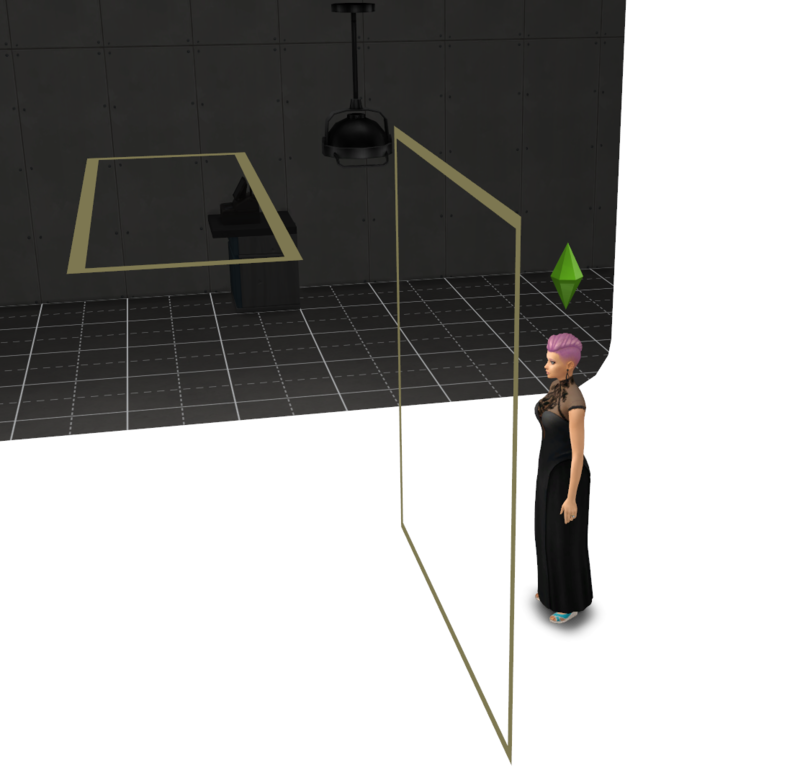 Once in-game with a built photo studio and placed sim and backdrop, hit Ctrl + Shift + C and type in testingcheats true. Then type in bb.showhiddenobjects. You can also copy/paste the codes I listed. If you are using the cheat shortcut mod, just use the shortcuts it lists. Head to the lighting section and the debug lights will be in “Misc”. I recommend using the Debug filter so they are easier to find. I’ve marked everything in the pic below. The lights we are mainly using are the massive 3x3 lights marked below, and the 2x2 ceiling light. Select the wall light first and then flip it by tapping , or . twice. For some reason these wall lights come out backwards and the light source is actually facing you. Keep this in mind for all future uses of the debug wall lights. Anyways, then place the lights similar to what I did below. I show the light placements at several angles to help you. There are different ways to achieve neutral lighting, so if this is too complicated you can experiment on your own. I did mine this way to account for the brightness of the lights, and to ensure that majority of the shadows and highlights were eliminated to give me as much neutral lighting as possible. I also want her well-lit and not too dark or bright, because a brightness/contrast filter can’t fix everything (please keep that in mind for all lighting). And if I need to I can also make her brighter or darker by bringing any of these lights closer or further. I generally leave the side lights alone though as they are meant to keep the side shadows at bay. Here is another neutral lighting I did back in the day, but with an orange toned ceiling light (on lowest setting, otherwise the orange is too bright). The orange light is great for giving those pale sims a bit of color and helps eliminate the washed-out tone some sims get from just white lighting. 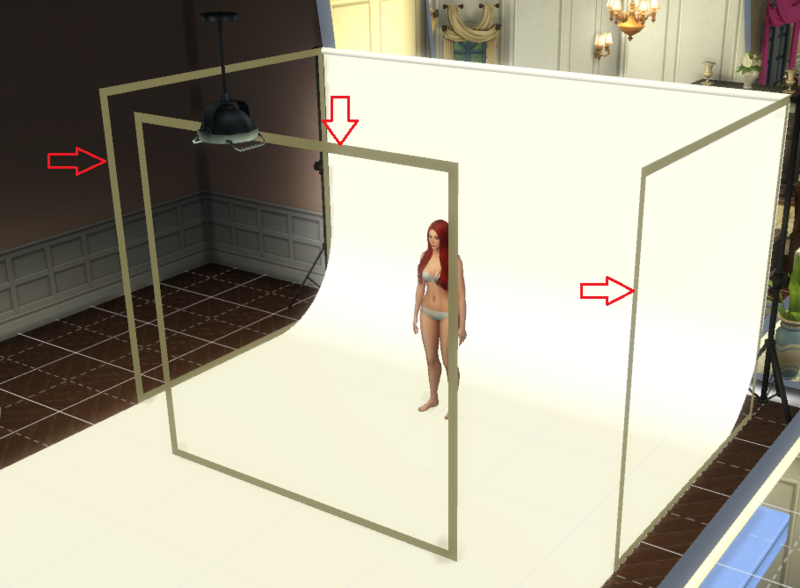 Colored lights can also be useful for blending sims into backgrounds if you are still unfamiliar with editing and filters, such as a blue and green light for an underwater shot. There are all kinds of uses, so don’t be afraid to experiment. Again, remember to adjust the intensity, otherwise it will be too strong. To get to the colored lights and decrease the intensity, click on the light and select “Set Color And Intensity” and then “This Light”. This will bring up a menu with different colors and a Dimmer setting. The left of the Dimmer slider is the lowest setting, right is highest. There are also a few colored debug lights that came with Jungle Adventure that you could try using, but there is no Dimmer setting. Next is basic lighting, which is easily achieved with fewer lights. Here I use only one 3x3 wall light, one 3x1 ceiling light, and a regular ceiling light with low-middle intensity to help with brightness. I placed them as such. By the way, if the ceiling lamp is too low adjust the wall height! Not only is she now slightly brighter, but she has noticeable highlights and shadows. Besides maybe adjusting the brightness to be lower, this is perfect for most well-lit backgrounds when you are a beginner. Remember, poses, CC, and skin tones can affect the way the lighting looks and may need to be adjusted. Also, remember to experiment! 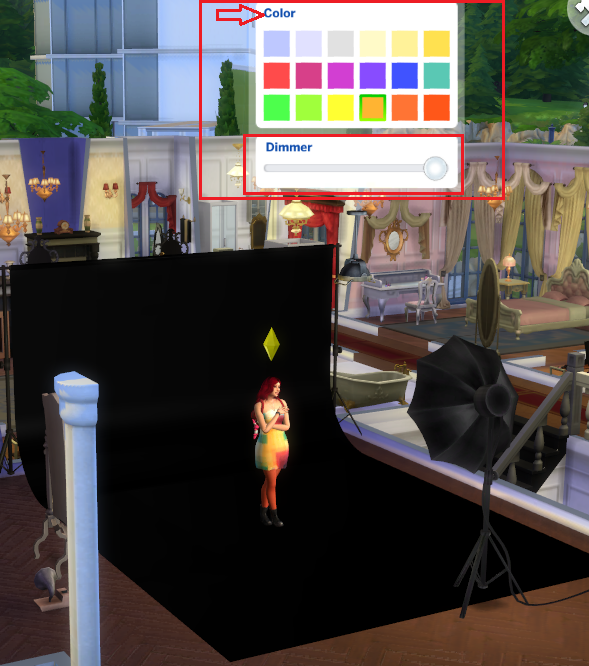 An extra tip is that you can use in-game lighting to prepare your sims for dynamic light backgrounds. 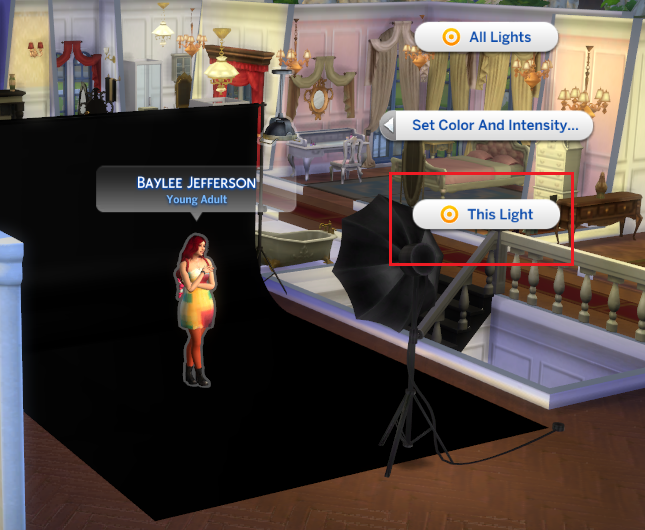 For example, if the light in the background is behind your sim and to the right, you can place lights in a similar spot in-game to get similar lighting. 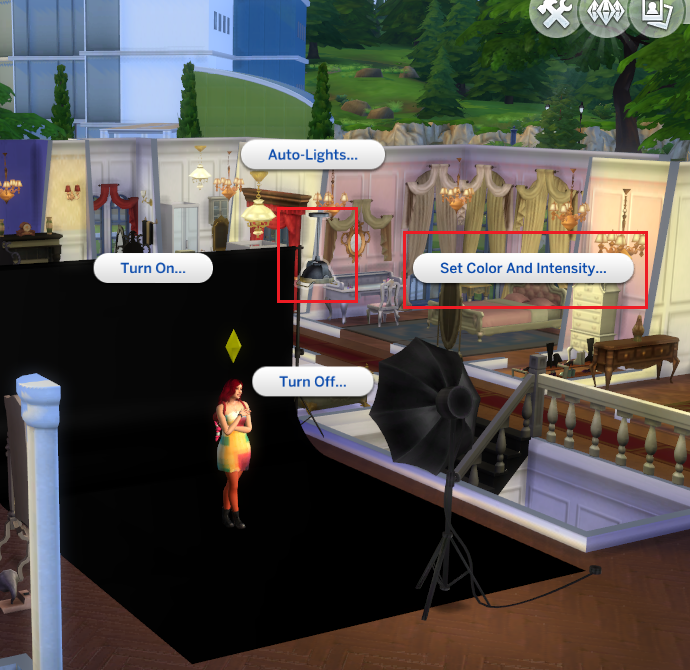 Just like the colored lights, this will help your sim blend and look more natural. Next is cropping, aka body shot types. I’m still seeing people struggle with this, so let’s cover this in detail. The info below is from my Assignment Terms and Requirements tutorial. If you find yourself struggling with terms and requirements/brief still, I recommend giving it a read. We are going to start with the face and make our way to full body. This is a very close shot of the head to get a clear and detailed shot of the models face and skin. Usually used for skin care ads, some makeup or hair ads, and usually just a request from the host for applications or another type of assignment. Long hair is suited for this type of shot as a frame, it looks better and doesn’t leave an empty space behind the model’s head. Most of the head and hair to get in really close, and the rest of the body. Try to avoid the chin and the rest of the face if possible. Shot of the models head, starting under the clavicle or top of shoulders and up. The top of the head (including hair), the face, and tips of shoulder if you can help it. If the arms are above or around the head, do not cut them or the fingers off. Shot ending directly after the chest but above the belly by quite a bit. Rarely used. The head, and arms and fingers if they are above the chest. Shot ends at the hips when a 1/2 shot, but can be moved up to the waist or belly depending on what the host wants. The belly/waist shot is and can be its own crop, so make sure you understand what the host is saying when reading the requirements. Also, this can sometimes be a confusing shot due to misinformation, with people cutting off at the hips instead of the waist and vice versa. I’ve included a diagram of both males and females so you can familiarize yourself with the regions and avoid mistakes. Arms and fingers if above the shot area, though if the fingers are only missing a few inches below the cutoff, move the camera further down to capture the rest of them. Do not cut off the head either. Known to be one of most confusing shots, but the second most common compared to full body shots. Ends right above or right below the knees, never directly on the knees! Can be cropped at mid-thigh as well. Also, do not cut off the body at the ankles, low shins/calves, toes, or feet! It is an awkward way to cut/crop the image, and wouldn’t be correct if you’re past the area directly below the knee. Everything directly under the knee. Head, and arms and fingers. The entire body is shown in one whole piece. Everything! All limbs, toes, fingers, and the head must be present to fulfill the requirement. Anything cut, whether it partially be the toes, fingers, head, heel, etc. will result in loss of points. Other Known Names: Any Shot; Hips and Up; Partial and Up; Etc. When a host says something along the lines of “Partial and Up”, they mean that any form of shot is okay as long as it doesn’t go past the areas they mentioned. So for “Partial and Up” you can do a head shot, hips shot, partial shot, or chest shot. The one you choose determines what you can cut-off. As usual the head, arms and fingers, and toes if a full body shot, etc. The assignment for this challenge is to turn in 2 well-lit crops of your choice, preferably ones you have never done before or struggle with. Full body shots are obviously the easiest ones, so I recommend avoiding that one to ensure you get enough practice with the others. 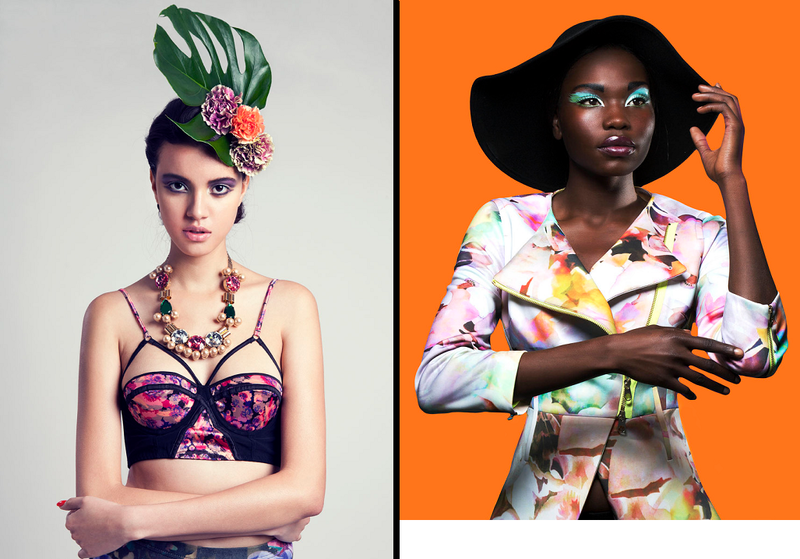 Poses and styling are up to you, and no need for editing! This is just an in-game shot to show that you have correct lighting and understand body cropping. And that’s it! I hope you all enjoyed this challenge, and if you have any feedback, questions, or concerns just post or message me. Thanks for reading! Hey guys! The Sims Editing Workshop has decided to open a thread here on the forums so forum members can participate in the challenges. Challenge 1 for Beginners is up for those interested. We are covering Game Setup and Cropping! Game Setup includes proper settings, recommended mods, photo shoot building and lighting, and cropping is covered in detail along with tips and guidelines. We will have Intermediate and Advanced challenges a little later for those of higher levels, so please stay tuned! ~ I would love to do this,but, I am on a two to three month waiting list for surgery, I am just hoping that this will take my mind off it all! ~ My worry is that I may not be up to some of the rounds, & I would hate to hold any one up! ~ Also did Luima update the CAS lighting Mods after the 13th Nov patch? I use them, but they have been taken out since the patch! ~ Tell me if it is OK, otherwise I will lurk! @aussiekarima @TEXASTWANGTONYA Hey guys! Thanks for the interest. I probably should have explained things a bit better. This is isn't a comp but instead an activity, meaning all the rounds are optional. You are also allowed to read and complete the challenges at a later date if you really want feedback but had to miss a round. Even though I can't speak for the other veterans, I know that I will still make time to provide feedback for previous rounds. I checked and he did not, however, they are not script mods and no one has reported them to be broken yet. I went in-game with them and everything was fine on my end, no crashes, errors, etc. I didn't check CAS but it should still be fine. I checked all the mods for updates before listing them, which is why I said some that I normally would recommend were not listed due to being broken. And yes, it is totally okay for both of you to participate! As I mentioned in the opening post, everyone is welcome to participate in the rounds no matter the level! Advanced members can join Beginner challenges, Beginners can join Advanced challenges, and so on. But like I also mentioned, please be aware that the wording and expected knowledge may be different for each level. However, my goal is to get everyone mostly "caught up" so that when we cover harder material there is less confusion, etc., which is why Beginners are starting first. I also forgot to say that the other vets may run their own challenges, and I am just taking the lead at the moment to get things started. When they do I will ask for permission to post here and also pass the pictures along (if they don't want to login to the forums) so you guys can get feedback and learn. Some challenges may not be possible to post here though, like any screen share events. Hopefully that answered all of your questions! Also, @TEXASTWANGTONYA you are on the Discord but don't have the beginner role, so you can't see this challenge on there. Are you going to enter beginner challenges through the forum instead then? ~ Thank you @MizoreYukii ♥ ♥ I am so in! So were do I start? ~ What is screen share events? @aussiekarima Just read Challenge 1 and make sure you understand it, then complete the assignment described below it before the due date! The assignment is meant for you to try out the challenge and then submit for feedback. That's all there is to it. Discord, where SEW is mainly hosted, allows a video chat called "screen share" where it shows the person starting the call's desktop. People can watch the person play games, edit, or do whatever. The veterans and I have discussed hosting those before, but at the moment only group chats allow it. It's in beta mode for servers and ours does not have it, so hopefully we will see them release soon. Anyways, unless the person hosting the screen share also records it, we can't post it here for you guys to see, so that's what I meant by some challenges not being available for the forum. ~ Thank you @MizoreYukii I will have to wait till after CHRISTmas to get this done as I am busy till them, (going to my Mom's for CHRISTmas,she has a very inviting swimming pool! )but I will get this done on time, I only have one model assignment for Versace's Finest, to do, so have all the time in the world to do it,otherwise I would just be playing or Moderating on a FB group! @TEXASTWANGTONYA Just assign the Beginner role on Discord to access the channel! Hey @MizoreYukii I just now spotted this challenge and it sure does look inviting! I know I could use some guidance and helpful tips/critiques. I'd love to do this, but with my work schedule I may not get to submit the assignments on time, hence why I haven't joined in on any competitions (to compete). Right now it's all I can do to keep up with Versace's as a judge/host. I love all the hours I'm getting and don't want to look a gift horse in the mouth, but sometimes I just wish I could get a small break so I can sit back, shop for some CC , open up my game!! and either build something (which I have lost my building mojo ) or do challenges like this. But...if we can complete them and post at a later date (well maybe not too late, like next year or something. Gotta keep in in the same century anyway. Haha) I just may start gathering everything you stated and start to put something together and hopefully get to work on it when I've got a minute or two to steal to myself. @Mamajanaynay Glad you're interested, and yes, submit at a later date if you need to! I've changed the due date for Challenge 1 for several reason. Challenge 1 will close on January 1st, and the Mini Workshop will open January 2nd. Mini Workshop 1 is learning about your editing program to make sure people understand how to use it.